Inkjet printers use cartridge full of ink, and may have 4 or 5 different coloured cartridges. 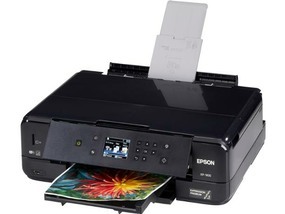 Epson have bought out a printer which they refer to as an EcoTank printer, these are much more expensive but refillable ink tanks should reduce consumable costs. The vast majority of printers are based around the A4 paper size although there are a few that do allow you to print on A3, these tend to be a little more expensive. Feature which you may be worth while considering may include, colour or B&W automatic double sided printing, photo quality printing, scanning and copying, ability to print from SD cards, WIFI printing and ability to print from mobile phone, or tablet and what print speed you want. If you do a lot of printing then you probably ought to consider a heavy duty printer, some quote a maximum number of pages per month to help you make a decision as to whether it will meet your demands. Once again the features you will need to consider are those mentioned above. You may also find the heavy duty printers that also scan have a document feeder which can be useful if you need to scan lots of pages of the same size, or copy multiple pages. Whatever you do check out the running costs and product reviews. A cheaper printer probably won’t last long and you are likely to have more paper feed and jam issues. Don’t think that compatible cartridges are the solution to cheaper running costs, they are sometimes a false economy and a lower quality product which may not produce good quality results. In any case we would always recommend using genuine replacements during your warranty period.